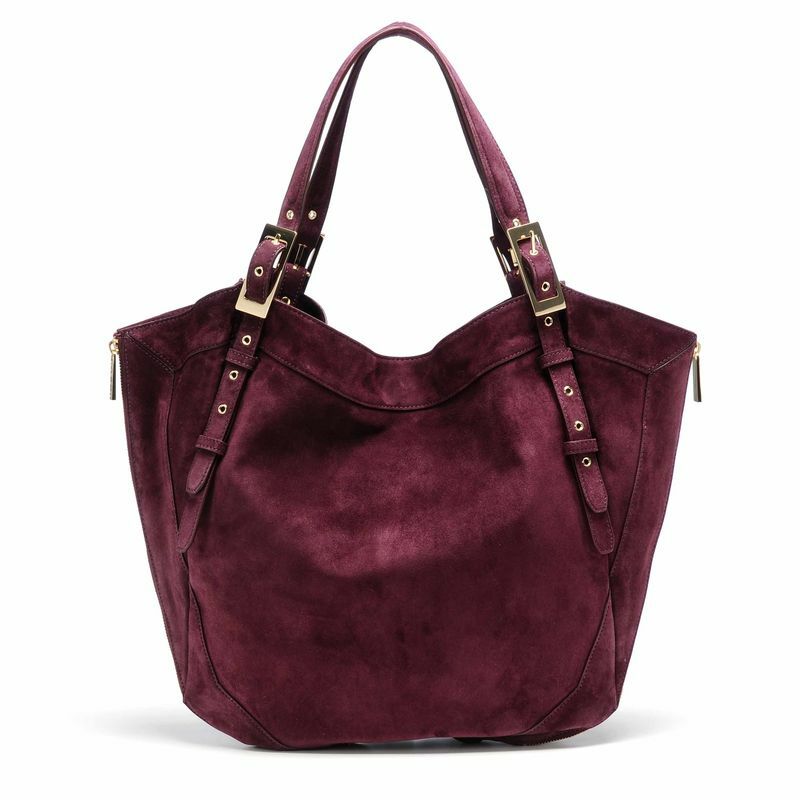 Let's talk for a hot sec about how much I want this bag. 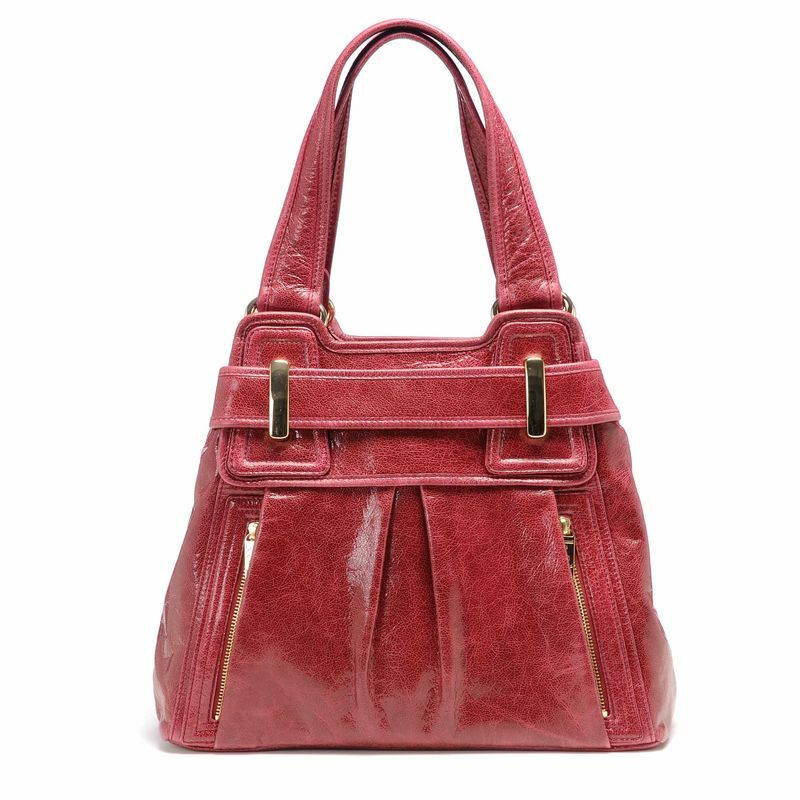 I'm an unabashed accessories–especially bag–ho, as ya'll know, but it's been some time since I've craved a purse with this intensity. To make matters worse, Kooba's above Camille bag is somewhat limited, created specially to be worn on Bravo's NYC Prep (actually the bags will appear for the first time tonight on the show's second episode). Now do you want it even more??? See, I went to a NYC prep. I attended drunken fêtes in museum sized rambling apartments. My name graced fliers for fifteen-year-old promoter friends, who threw parties at Chippendale's (yup) and Club USA. I threw swanky dinners on a friend's penthouse deck, while her parents were in the Hamptons, purchasing high-end ingredients on our parents' accounts at Citarella, Zabar's and Fairway back when there was only one (gasp!) location of each gourmet shop. There were boys, drugs, robberies, snobberies, grades, failures, what-have-you and I was even edgy in the face of it all (from an art world family, where intellectualism was prized above status and money). 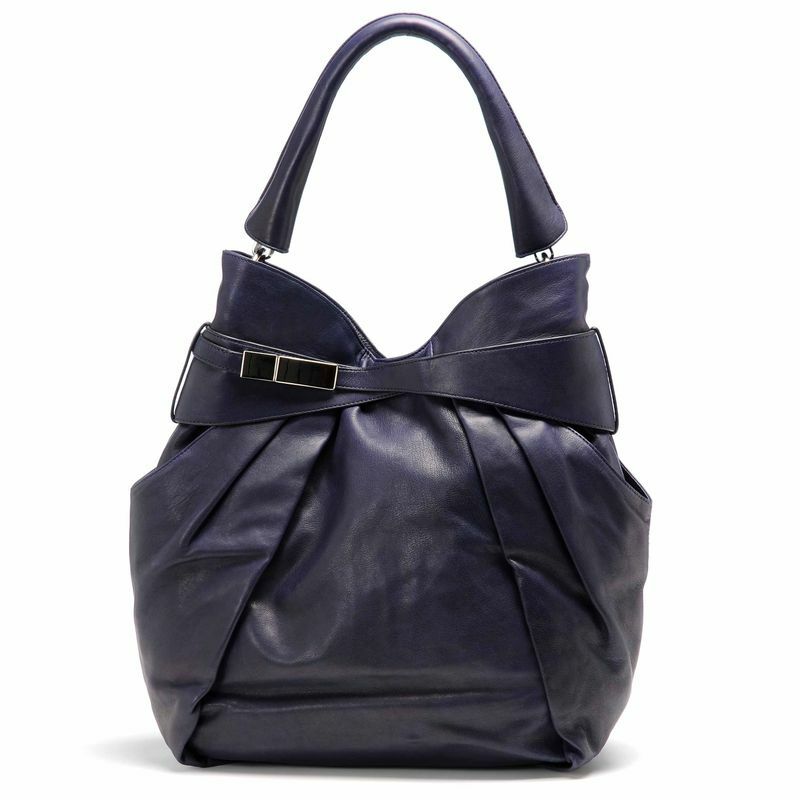 But no one EVER designed me a bag, let alone one this beautiful! Do you think it's because I was Upper West? I feel deprived. Well, teens these days better count themselves lucky cause this is some seriously amazing stuff. Am I about to sound old, raving about how youth is wasted on the young? Now, that's just sad. Here goes: There are four special Kooba bags total in this exclusive collection and you can buy one for yourself at Shop Bravo. 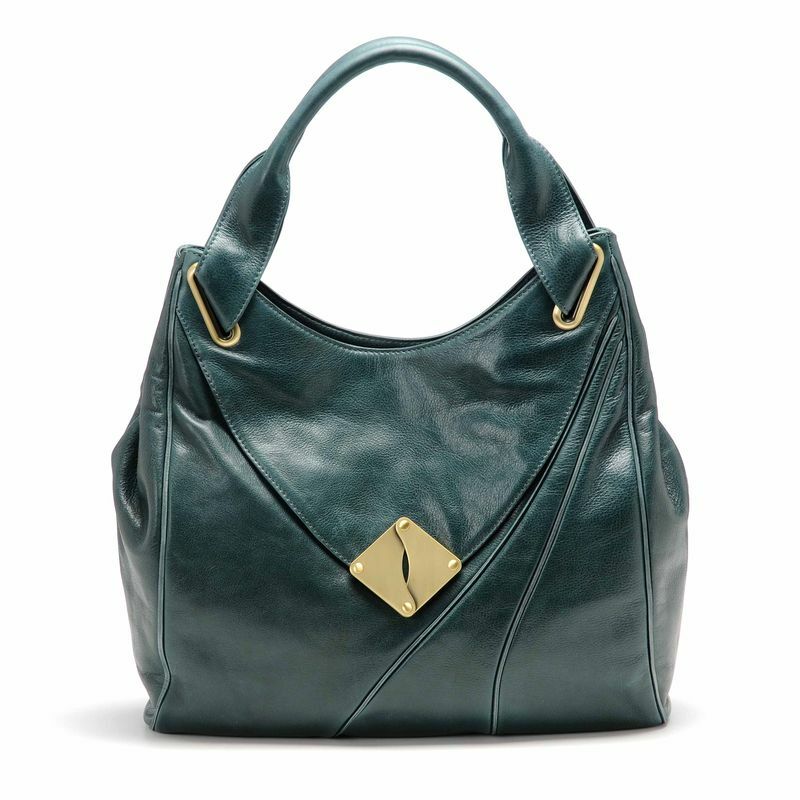 Every piece of the collection is beautiful, but I am particularly fond of the navy Camille (above) and the Taylor Bag in teal. What do you think? Meanwhile, I'll be lamenting the timing of a childhood before reality TV and, well, before Kooba. And that, my friends, is a whole nother kind of baggage. A wise man once said, "The times, they are a'changin'." That man advised "getting with it" and accepting said change or, he warned, "you'll sink like a stone." Eh. What did he know? He was probably on a pharmacy's worth of drugs at the time. I prefer to fight change at every turn or at least pout about it . . . loudly. HARUMPH. (Okay, maybe not the kind of change he was referencing, but . . . you get the picture). Well, lately it seems like things are changing in every aspect of my life and at an intense and rapid pace, so I hardly imagined feeling remotely happy at an intimate Sunday afternoon goodbye party for my friend C.R. Though I'm happy for him, of course. Blah, blah. blah. Whatever. 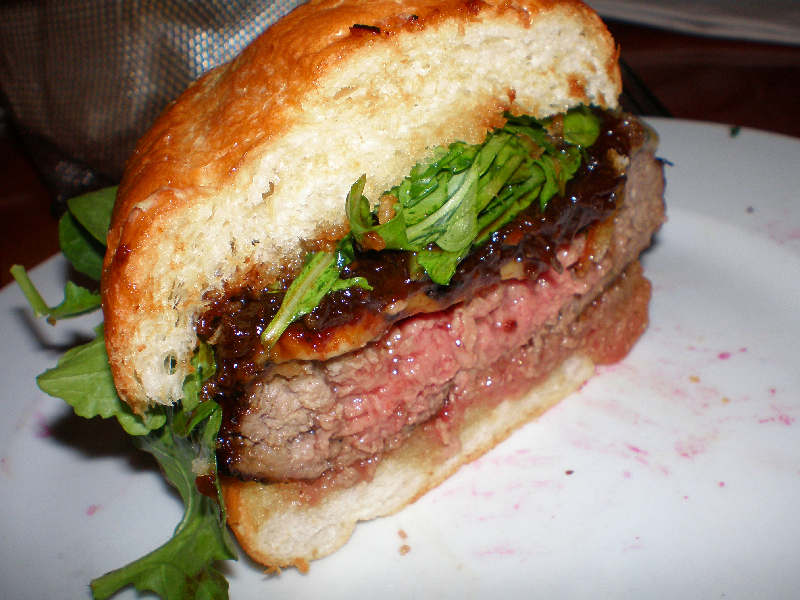 Still, he chose the Culver City Father's Office, which I've actually never visited, so I was excited for their notoriously delicious burger with gruyere, blue cheese, caramelized onions, smoked bacon reduction and arugula. I like the vibe at the original, crowded, dark, pub-like Santa Monica spot, but the noise level is sort of deafening and the seats are few, so this was definitely easier, brighter and closer to home. I won't go on and on about the burger and CRAZY GOOD SWEET POTATO FRIES that got scarfed long before my camera was remembered (or about the sort of fab bathroom situation) cause many a food obsessive already has covered this territory. But I thought I'd at least post an image of that amazingly delish creation, which proved just as yummy as I remembered, if only to remind C.R. about what he'll be missing in NYC. That's right, my dear C.R. I will never forget our Dorito taste tests,"vegetarian" bacon runs, Franzia box wine-filled college art openings, video game vs. heroine addiction debates, my knee high boots, your puffy white jacket. Good outfit. Bad hair. NOW! Come visit often; for the burger at least. P.S. I still want my sidewalk crack image! NOW!!! 1) My sister informed me that this week's discounted featured French-milled bar soap is Wild Blackberry (which, if you haven't ever used before, is actually INSANE). Seriously, it's like the best thing you've ever smelled. 2) As you know, if you've read The Pocket Lint before, I'm OBSESSED. They actually make their soap in San Diego, but the scents are concocted in Grasse (yup, the South of France) like so many upscale perfumes. And the creams specifically are amazing, especially for people with dry or sensitive skin. 3) The site always has great sale items, so I like to regularly check and see if my favorite Green Fig Hand Cream (in a tube) or Gardenia Bath & Shower Gel have made the "I feel slightly less guilty buying this" list. 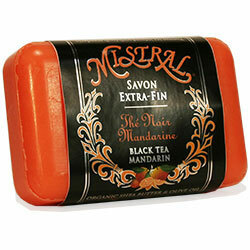 Anyway, I happened upon this new flavor of soap, Black Tea Mandarin, which looks just unmissable. First of all, black tea is meant to have healing properties (not the least of which is that it turns sunburns to tans–key for summer). Maybe that's because it dyes the skin. Or maybe that's an old wives tale, but I once read an Archie comic where Betty soaked in a tub full of black tea bags and it totally worked for her. She came out golden. What's good enough for Betty is good enough for moi. I think she even won Archie's love that time. Sigh. This may seem like small news compared with the whole “icons dropping like flies” phenomenon that seems to be happening today (sad and bizarre), but B + S reports some happy news in the midst of all this loss: Doughboys is reopening on 3rd Street! Okay, that sounded lackluster and is clearly not be enough to cheer a nation mourning Farrah Fawcett, Ed McMahon and Michael Jackson at once (sheesh). Still, let’s try to look on the bright side and focus on a future filled with Pan Bagnat sandwiches and, of course, Oprah’s favorite Red Velvet cakes. Time to embrace life. This new incarnation may be slightly different (or so it sounds), but hopefully bigger and better. Just a little boost in these progressively intense times . . . 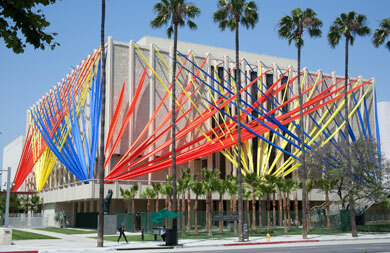 BUT I think you should all go out immediately and see "Your Bright Future" at LACMA. The new show, featuring a slew of dynamic contemporary Korean artists, is opening this week. As my madre, Lynn Zelevansky, curated the shabang, I had the pleasure of attending the opening last night, which was–well–as bright and energetic and lively as the name might suggest. This is my mother's last major show as a LACMA curator and, while I won't miss the spotty Patina catering (sorry, but it's true), I know I'll miss the levity of the museum's outdoor cocktail parties and celebrations. My sister and I grew up wandering first downtown galleries and later black tie gala openings in MOMA's sculpture garden. When we arrived in LA, the first opening I attended at LACMA was a Diego Rivera retrospective (I believe) and I was immediately struck by the laidback, festive vibe of the affair. And this show, in particular, has a great energy and sense of humor, befitting my mother's last LA hurrah–for now, that is. You know, it's hard out here for a pimp (especially if said "pimp" happens to be a lactard). 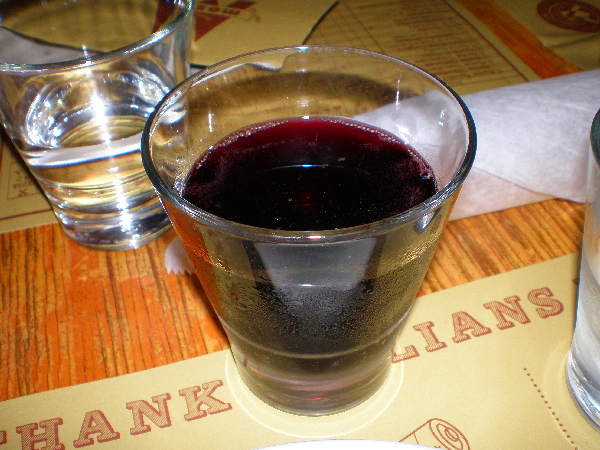 First, I ordered a glass of Lambrusco, which was super dry and rich (great–if you like them that way). To be honest, I like a sweeter version, but I think that's just my bad breeding, right Dad? Pizza-wise, having sampled many a Mozza version, I firmly believe that the Salumi, Mozzarella, Tomato and Fresno Chili Pizza is the bestest. (It's now called something slightly different that I should have noted, but, if you describe it, the waiter will point you in the right direction). 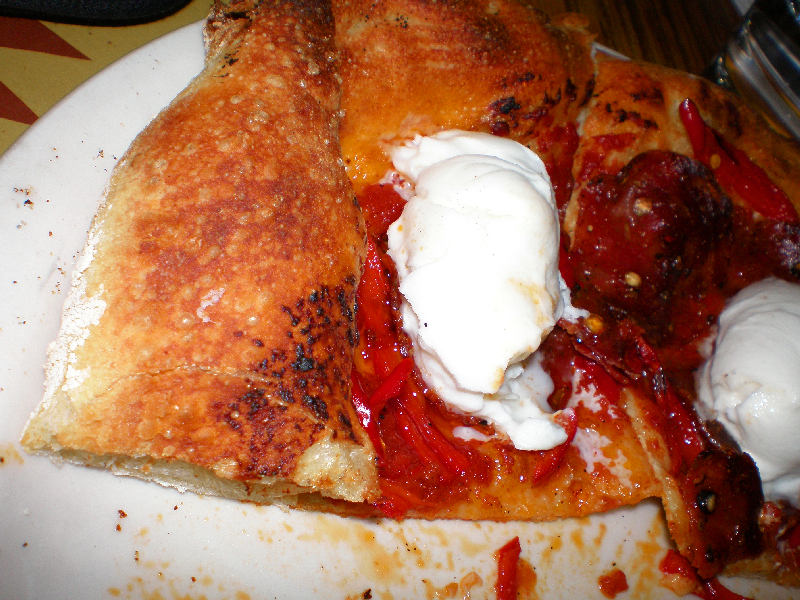 The crust is always crusty and chewy goodness, the chilis are spicy and the salami is just perfection. (See half above, after I'd already devoured the first slices). They let me sub buffalo mozzarella for a small fee, which made all the difference. A small part of me suspects that they actually gave me burrata instead of buffalo, but my "just in case" lactaid did the trick anyway. 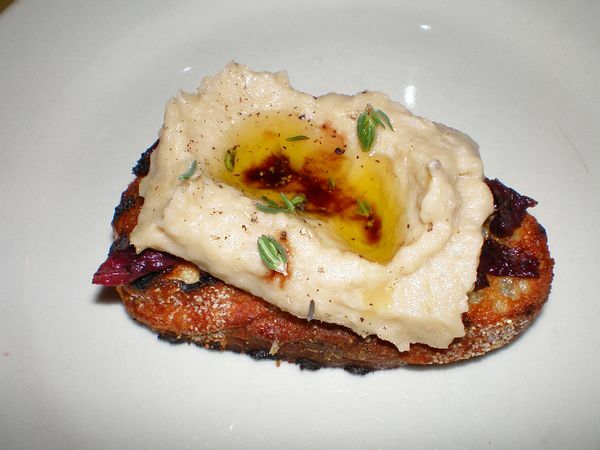 I would feel robbed without the Bruchette with White Beans alla Toscana, extra virgin olive oil and saba (above). 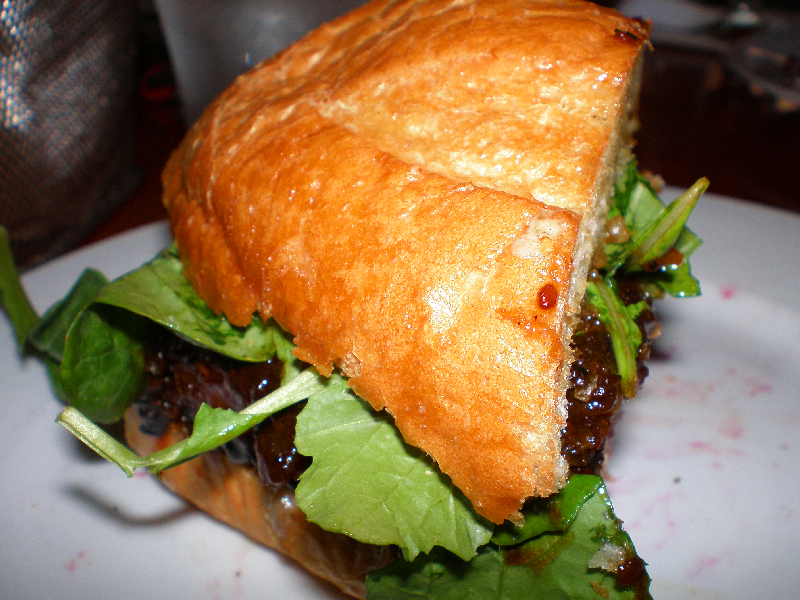 I just love the texture and flavor, plus it's just another excuse to eat olive oil and great bread. What could be bad? And my beloved brussel sprouts were out of season (I don't even like brussel sprouts from anywhere else), so instead we went for Crispy Goat Cheese and Umbrian Lentils and also a seasonal Farro situation with cucumbers, goat cheese, onions and some acid to cut the richness of the rest. Both were delicious, as expected, though it's hard for any lentils to touch the crispy ones from Cobras & Matadors. Finally, for dessert, I just had to order sorbet, which I figured would be decent, but basically sad cause it's not ice cream or whatever. I could not have been more wrong. I ordered chocolate and coconut and they both tasted like heaven on earth with more texture than the average sorbet: chunks of fresh coconut and crunchies in the chocolate. See? I was so drunk with happiness that I couldn't even take a focused picture! Anyway, that was my cow cheese-free Mozza experience. Now, may I please have some more? Maybe next diet "cheat night"–right, Drew? In 1992, when designer Issey Miyake launched his first fragrance, L'Eau d'Issey, we were still innocents. We didn't know from a second Bush. We couldn't give a crap about some chick Monica Lewinsky's soiled dress. (Not that we really care now either.) Teenage boys wore Starter jackets (or flannel plaid shirts in Seattle). Girls wore bamboo earrings and a bad attitude (or at least posed that way). And the concept of unisex fragrances was just coming into vogue. CK One was just a dot on the 1994 horizon. Other Issey scents have followed, but now (for the first time in seven years) the designer is launching a new fragrance simply dubbed: a scent by issey miyake. (That's all lower case folks, like the cool kids on iPhone and Crackberries do). And, although times have changed, the designer has stripped the fragrance and design down to its core, just as he did the first time around. Just look at the transparent bottle–how cool, right? Miyake has conceived the fragrance and packaging concept like he has his newest clothing endeavor, a line called A-POC (A piece of Cloth), which also strives to strip the concept of clothing down to it's most basic level. Personally, though I experiment more than the average person, the fragrances I love tend to skew "fresh" or "green." That is actually not just a descriptor, but a technical category of fragrance (and is not to be confused with "green" like "eco" cause there ain't no patchouli here). And, as Miyake's goal seems always to create fragrance that smells like air, we're a sympatico match. I like scents that smell like clean, if that makes any sense. This fragrance is in the vein of the first, which is good with me. I was a devout wearer. It's described as "green-floral-woods" with notes of verbena, hyacinth and jasmine. But it has a slightly more herbal, earthy note that recalls this current moment's preoccupation with a return to the land, back to basics, local farms, organic growing, low maintenance bohemian living, dinner parties served to cushion poised guests reclining on the living room floor, jewelry and crafts made by hand. Miyake seems to project all this and then modernize and sterlize it, underlining the simplicity with the cleanest lines (the fragrance's bottle) and a crispy scent. 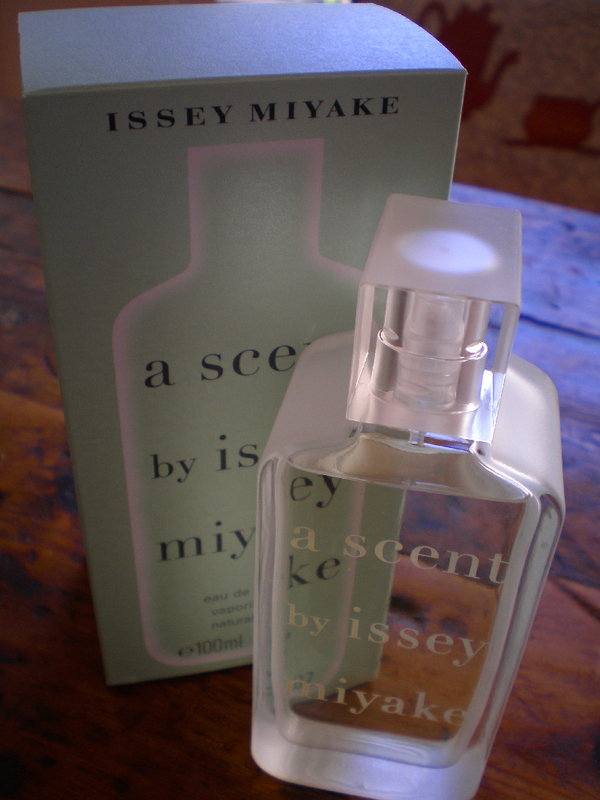 a scent by issey miyake actually doesn't launch until September, but I feel fortunate to share the goods with you now. I know I'll be sporting a new fragrance. Have a very Zen day. "Comfort food" is a subjective concept. As a salt addict growing up in NYC, my idea of comfort food (combating everything from malaise to nausea) was a local diner's Greek Salad and French Fries. Maybe some Mozzarella Sticks to boot. Andre prefers Spaghetti and Meatballs. To each his/her own, I suppose. Still, when people get sick, we seem to universally crave hearty, warm dishes: soup, stew, porridge, rice. Andre and ma mere aussi swear by Mishima's Nabayaki Udon soup with thick white noodles, mild broth and everything thrown in from chicken to egg (which came first? nobody knows). My father loves Congee or Juke (an Asian rice porridge) combining various meats and exotic veggies (like the salty preserved kind). Well, I spent this weekend holed up on the couch and napping on any cold tile floors I could find, as I had the flu and a higher fever than I remember having since childhood. Pitying their ailing (well, recovering) younger daughter, my parents decided to celebrate father's day at local izakaya and sushi staple Yabu. Normally, I would swear by their delicious Shrimp Shumai (closest thing to Hasaki's Shrimp Shumai that I've had in LA), all manner of sushi and sashimi and (yum!) Seaweed Salad, but–being sick and all–I went for their quintessential comfort food: Soboro Don (see above). 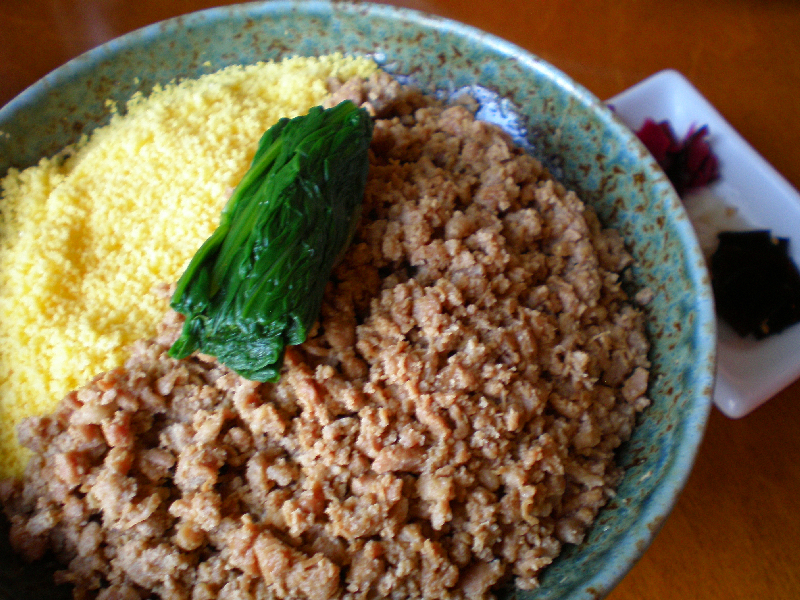 Their versionis just simple rice topped wth slightly sweet and soy flavored ground chicken, egg and spinach with a side of pickled vegetables (which, of course, I love texture and acidity-wise to counter the rich density of the rice bowl). It was delish, as usual, though I noticed it's not officially on the menu anymore. They do still serve it upon request, so don't be afraid to ask! Andre and The Rents also shared this special appetizer of deep fried lotus root and curried chicken served with lemon and curry salt. I didn't get to try it sadly (poor LINTY), but they all said it was awesome and peered at me with pity. I don't know from where all this awesome curry salt love is coming, but I'm liking it; Quite. A. Bit. So, here's to my own speedy recovery, to the incredible luck of discovering a three day sample of free Premium Cable while stuck on the couch and to the resulting ten movie marathon! LA (GUINEA PIG): THE BEST CREAM SHAVE? My last "Guinea Pig" posts were a bit of a bust. I mean, my eyelashes DEFINITELY grew thanks to Revitalash, but then I had to discontinue use when I found out that there's a minor chance that my eyes could change the color due to some glaucoma fighting ingredient in the stuff. Still, here I am trying something new again. Something a little less risky, I'll admit. My friend B. tipped me off to Trader Joe's incredibly inexpensive Honey Mango Cream Shave and raved that it was literally life changing and totally unbelievable. Well, I clearly have to find out for myself, so I'll be heading out to the brand new Trader Joe's at Sunset 5 (Yay!) to buy the stuff and test it out. My legs definitely require some seriously moisturizing shaving cream/gel shagangs, so we'll see if this $2.99 sitch measures up. I think maybe it's copy of (ahem, homage to) Alba's pricier version (normally upwards of $6)? I'm inclined to buy both actually and "taste test" so to speak. At least as of now, I don't actually plan to eat it, but you know . . . if I get hungry enough on my stupid diet. I'll be back (with an Arnold accent in honor of the new Terminator). So timely, no? P.S. Props (yeah, I said props) to whoever took the above picture. I found it online and have NO idea who took it. Sooorrry. HEY! SHUT UP!! DON'T LIE TO ME! YOU THINK I'M BLIND? BUT I'VE GOT EYES TO SEE. HEY, MR. . . . Okay, sorry, I got carried away. But, seriously, this is EXTREMELY exciting for me. I know I've mentioned LaLoo's Goat Milk Ice Cream before because I feel like it's practically a perfect food. When I realized I was a lactard, I just assumed I was relegated to a life of sorbet and weird, chemically-flavored, pretend rice ice creams. Then, I found LaLoo, which is great because it doesn't pretend to be anything it's not and it's not remotely hard on your stomach like soy can be. It's not made of grains pretending to be dairy or whatever. It's simply a different kind of dairy than the usual cow stuff. And it's naturally just way less fattening. 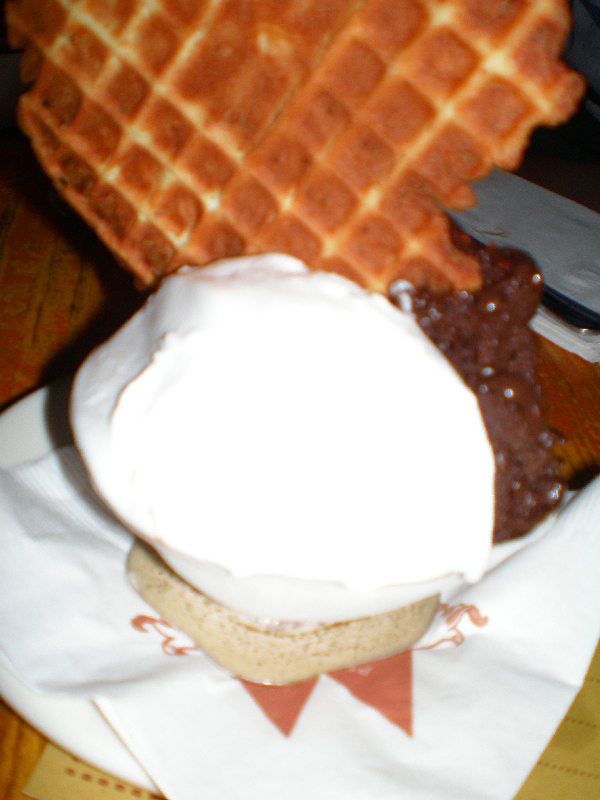 Then, LaLoo introduced a mint chocolate chip and also a cappuccino version (coincidentally my two favorite ice cream flavors). 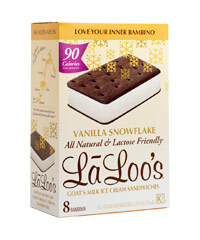 And now, as if things weren't wonderful enough in the goat milk product arena, LaLoo is introducing goat milk ice cream sandwiches called Bambinis. And (drum roll please!) they're only 90 calories. Incidentally, a Tofutti Cutie is 130. And that's tofu. Basically, I need to run to Whole Foods. Cause this isn't just the best goat milk innovation since cappuccino ice cream. This is the best thing since sliced bread. And sushi. Sushi is good too.